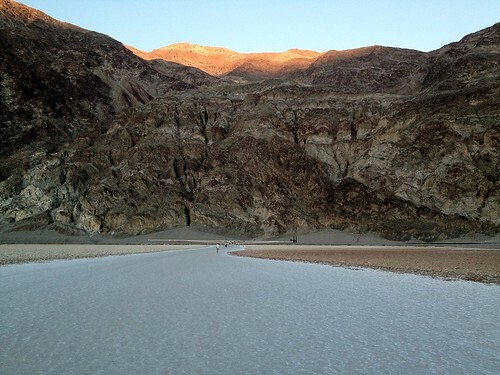 The main picture here is the setting sun at Badwater Basin, the lowest point in the Western Hemisphere at 282 feet below sea level. I kept thinking what a strangely beautiful place it was out there. Everyone wants to know how hot it was. Make no mistake, it felt like an oven and the boisterous wind only served to dry us to the bone. For the area though, it actually wasn’t too hot. When I checked, it was right around 102 degrees, the same as what we had been getting in Las Vegas. Other than a wide, smooth path created by people walking, the basin wasn’t the flat, tile-shaped blocks of salt and earth that I expected. In many places, the ground was all rough and broken up. However, it is quite possible I was simply in the wrong area for those pristine shots of the honeycomb-shaped flats. After walking out on the flats, my friends and I decided we should head to the sand dunes. According to the National Park Service brochure, the dunes could reach as high as 120 feet. When we arrived the sun had already set. We walked the dunes barefoot, enjoying the warm sand and the expansive view of the stars. But we never found any big dunes and lacking flashlights we didn’t venture too far out. The sky was stunning though. I may have seen more stars than when I lived in Kalispell, Montana but in Death Valley there was nothing to obstruct the view. If you ever get the opportunity, check out Death Valley National Park. It was a blast. Haystack Rock is the most recognizable landmark on the Oregon Coast. Rising from Cannon Beach, Oregon; it’s a beautiful place to enjoy a relaxing day (or two) at the beach. The water is pretty chilly and most people only walk in the shallows. But it can be really refreshing to let a wave crash over you. Building sand castles and flying kites are both popular activities. Lots of people bring their dogs too. As with all beaches, be careful of undertow. If you find yourself pulled out to sea – swim parallel to the shore until you’re free of the undertow. Then angle toward the shore. Welcome to Cannon Beach, one of Oregon’s favorite beach towns. Enjoy the fresh salt air and the cool, refreshing water of the Pacific Ocean. If you enjoy long walks along the beach, you’re in for a treat. The beach stretches out from Haystack Rock quite a ways in both directions. Cannon Beach can be quite windy. You’ll notice a lot of people flying kites. During low tide you can explore the rocky area below Haystack Rock. See if you can spot crabs, starfish, anemones, sea slugs, and mussels. The dunes have tall grass and the occasional flower. After you’re done playing on the beach, there are plenty of little shops to browse and delicious food to eat in town. On the border of Alaska and the Yukon Territory, Canada. Near the end of 2011, I decided to move back home to Vancouver, Washington / Portland, Oregon after living for about 18 months in Anchorage, Alaska. Rather than flying, like I did on my way to Alaska, I decided to enjoy the scenery of the legendary Alaska-Canadian (ALCAN) highway. I saw glaciers, beautiful rivers, horses, black bear, several beautiful sunsets and miles and miles of wilderness in the Yukon and British Columbia. But it was a little stressful too. Almost two hours outside of Anchorage, Alaska my check engine light came on. It was the middle of nowhere with hardly any other vehicles driving by. So, I was pretty cautious driving home. Looking back at it now, it wasn’t a big deal and I should have stopped to do some hiking in Canada. Luckily, everything went well and I had a fun solo road trip. If you’re like most Alaskans you probably have at least one gun. I had bought a .30-06 rifle and a 12-gauge shotgun while I was living in Alaska. I was a little nervous about taking them through Canada, but it’s actually quite simple. There’s a form you have to fill out, print it at home and complete the form, it requires the serial numbers of the firearms and there are restrictions on certain types. But 99% of people should be OK. Make sure your firearms are safely stored in your vehicles trunk when you’re transporting them. Then when you reach the border, tell the officer immediately that you are transporting firearms. I was told to pull into one of the parking spots and bring the paperwork inside. If the officer doesn’t take it at the window, bring your passport and your paperwork inside. They do some writing and stamping and then you’re good to go. Initially, I figured I’d stop for the night before crossing into Canada. But I made such great time and getting through Customs was a breeze, so I continued driving until I was ready to sleep. I found a rest stop which only had one other occupant – a truck pulling a horse trailer. I parked on the far side from the truck and enjoyed some sleep. On day 2, after sleeping in the rest stop somewhere in the Yukon Territory I woke up really early, like 3 or 4:00 AM, and continued my journey. After driving for a while the sun started to rise and this beautiful sight greeted me. Then I nearly ran out of gas. I had driven through a very remote part without finding a gas station. Plus, it was still very early in the morning. The first two gas stations I found didn’t take debit or credit. There were those old school pumps from my Mom’s day. Unfortunately, the stations weren’t open. Not that it mattered, I had run out of cash the day before. My gas gauge was below E for a good 20 minutes when I thankfully came into this little town and was able to fill up. I was equally parts shocked and happy to pay $43.84 to fill up. To this day, that’s the most I’ve ever paid for a full tank. It was kind of a happy coincidence that I needed to get out and stretch my legs at Canyon Creek Bridge. I walked a little and learned a little. Teslin Lake was beautiful even during a cloudy, rainy day. Once I got into town I made to sure to pull out a fat stack of cash so I didn’t run out again. My second night was spent sleeping in the parking lot of a very expensive Lincoln log-looking hotel a little more than halfway between Teslin and Stewart, BC. On day 3, I got another early start and randomly came across these beautiful and friendly horses. Maybe an hour after seeing the horses I came across this black bear. It seemed entirely unconcerned about me watching it walk along the road nibbling plants. It stopped several times to stare at me. Apparently curiosity got the best of it and it shuffled up to my car, close enough to my passenger side door that if I was sitting there and reached out I could have touched it. After turning onto Glacier Highway, it started to get very foggy and rainy. It created a very eerie feeling as I drove alone down the road. I hadn’t seen another person or driver since I woke up. Stewart, British Columbia is a quaint little town. With an old fashioned downtown like you read about in books. The little restaurant inside the King Edward Hotel was the happening place to be. I enjoyed a delicious breakfast there along with probably half the town. Not surprisingly, I drew more than a few stares from the locals. After leaving Stewart, I made a bee line for Prince George where I relaxed, got a hotel room, and enjoyed a nice evening on the town. On day 4, I got another early start and I made the final push, driving all the way home. It was a really good feeling being back in Washington, passing by Mount Rainier, and seeing Mount St. Helens. I love the Northwest. Have you driven the ALCAN Highway? Leave me a message below in the comments. In 2012, I had the pleasure of working in Las Vegas for a few months. During one of my weekends, I drove over to the Mojave National Preserve to hike Cima Dome, which was really fun. One thing many people don’t know is that Mojave National Preserve is home to two of the world’s largest Joshua Tree forests. They’re interesting, gnarly looking trees with a lot of character. If you’re heat averse, you can drive through the Mojave and enjoy the trees from your air conditioned seat in the car. But I highly recommend getting out and walking one of the trails. It’s easy to find a peaceful and absolutely silent spot. Read a book, watch the sunset, or go on a real hike. Trees. Trees. Trees. More trees! Like I mentioned, I hiked out to Cima Dome. I also walked a few other trails, some had information signs, others were just old dirt roads. You can hike Hole-in-the-Wall Canyon, see old ghost towns, or photograph a beautiful landscape. Interested in visiting Mojave National Preserve? Click here for more information. Have you been to the Mojave? Leave a comment!